Photos by Nadin and Tom Abbott. 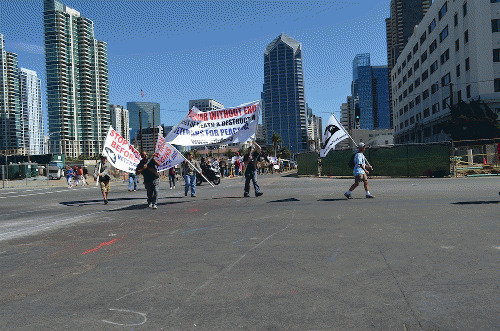 October 8, 2012 (San Diego)--Occupy San Diego reached an important milestone this weekend. Occupy San Diego is now one year old, and like all children, it has learned a lot this year, but also achieved quite a bit. The weekend saw a series of events, some low key, some going back to it's roots in the streets, celebrating the fact that OSD is still here. The first event was at Balboa Park on Saturday afternoon. When I reached the Park I was no longer surprised to see San Diego Police coming in to talk to an Occupier. Well, so what is new? Same old, same old right? This time, the officers had cause. No, not the usual we saw over the course of last year. They had a call, from another occupier, reporting what can best be described as a domestic dispute. Given the Occupier in question wore a Guy Fawkes costume with knives (which I could not tell at distance were plastic either), the cops showed up in force. This is standard. Moreover, while the Police kept an eye on Occupy, like they do on every demonstration that happens in this town, they also kept their actual contact to a minimum, and kept their distance. Later in the weekend I did learn that while Occupiers are right to be weary of the police, the police feels they went overboard early on. This came from an unnamed source, and I must add, it was a tad surprising. Just like Occupy, San Diego Police has learned some lessons. The truth is, the people who witnessed the behavior of the Police will not trust the Police ever again, so that is a loss for the Department in their community relations. We can all hope that this becomes part of the institutional memory, and next time, there will be one, when faced with people in the streets, SDPD will show a lot more restraint. That said, there were a couple incidents that could be seen as intimidation. For example a Park Ranger asked an Occupier about putting his cigarette off on the park, and the Ranger did not understand it was a medical Nebulizer, and the two officers with her were a little aggressive. But that is life in the streets in some ways. There was another incident on Sunday morning where Officers wanted to make sure a model drone did not have anything hard in it's core, and the Occupier got a little aggressive with the officers. Per usual, Occupiers are now filming all interactions with the police. Writer, blogger, journalist, based in San Diego. Started doing this with Occupy and has grown from there. As a trained historian I was struck by Occupy, which will be considered an important moment in US History, at leaset in my opinion. Workers March to Demand Better Conditions from Walmart. San Diego Nine go on Hunger Strike. Hundreds March on Mayday in San Diego.